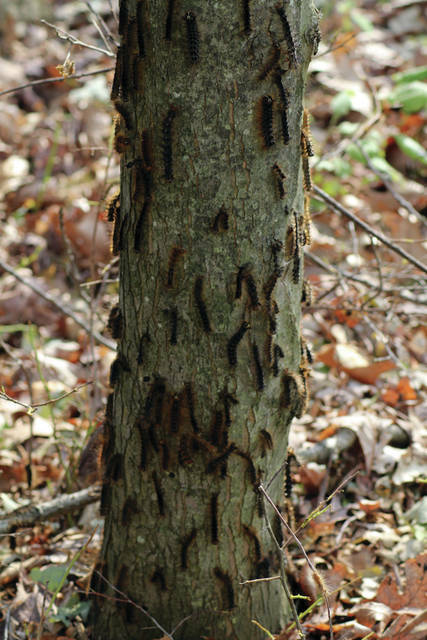 Gypsy moth caterpillars feed heavily on foliage which can lead to the death of trees. The battle against the gypsy moth will continue in Swanton this year and expand into other areas of Fulton County. Ohio Department of Agriculture staff members will host several open houses in treatment areas that will offer attendees the opportunity to speak directly with those who work with the program. An open house will be held Tuesday, Feb. 12 at the Fulton County OSU Extension Office, 8770 State Route 108, Wauseon. A second open house will be Wednesday, Feb. 13 at the Swanton Community Center, 217 Chestnut St. Both open houses are from 6-8 p.m. Gypsy moths are non-native, invasive insects that defoliate over 300 species of trees and shrubs. In its caterpillar stage, the moth feeds heavily on the leaves of trees and shrubs, and is especially fond of oak. One two-inch larvae can consume up to one square foot of foliage every 24 hours; each egg mass can contain 500-1,000 eggs. “In heavily infested areas, where there are 250 or more egg masses per acre, larvae can defoliate the infested trees,” according to the Ohio Department of Agriculture. In Swanton, the same general areas that received treatment in 2018 are scheduled for the same in 2019. In northeast Swanton, an area of 107 acres will be targeted. It ranges from Parkside Drive north to the Ohio Turnpike and Hallett Avenue west to N. Fulton Street. The second area is the eastern half of Valleywood Golf Club. There are multiple other Fulton County locations. They include mostly wooded areas in Pike Township north of County Road L and south of County Road N.
There is also a wooded area southwest of Lyons and just north of U.S. 20 and between County Roads 15-1 and 14-2. The final area slated for treatment is along the border between Fulton and Williams counties. In Fulton County, it is between County Roads T and S.
Detailed maps of treatment areas can be viewed at www.agri.ohio.gov. The focus will be suppression. The Suppression Program is in areas where the gypsy moth is well established and treatments are performed at the voluntary request of the landowners. Citizens who cannot attend the open houses and would like to provide official comment about the proposed treatment blocks should send correspondence to the department by Feb. 28. Letters can be sent by e-mail to plantpest@agri.ohio.gov or by hard copy to the attention of the Gypsy Moth Program, Plant Health Division – Building 23, Ohio Department of Agriculture, 8995 E. Main St., Reynoldsburg, OH 43068.
https://www.fcnews.org/wp-content/uploads/sites/45/2019/02/web1_Gypsy-moth-caterpillars.jpgGypsy moth caterpillars feed heavily on foliage which can lead to the death of trees.